Below is Chapter 2 of the Foresight Africa 2017 report, which explores six overarching themes that provide opportunities for Africa to overcome its obstacles and spur inclusive growth. You can also join the conversation on Twitter using #ForesightAfrica. 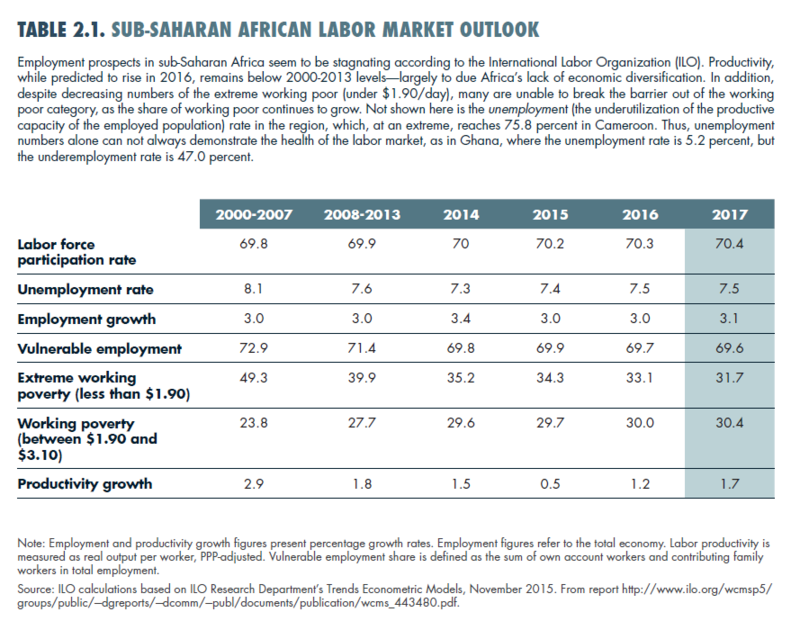 The demographic dividend has been touted as a potential source of growth for the African continent and its relatively young population.1 In the same vein, it comes with the challenge of employment creation that can absorb the large cohort of youth that is set to enter sub-Saharan Africa’s labor markets in the approaching decades. Less positively, however, countries that fail to plan accordingly might miss these potential opportunities or the resulting youth bulge could increase the risk of social tension and other risks arising from high youth unemployment rates. The year 2017 offers an opportunity for identifying and implementing policies to capitalize on the segment of the population that is quickly growing up. Relative to other regions, sub-Saharan Africa’s demographic transition begins from a much lower base and is beset by conflict and death from HIV/AIDS and other diseases resulting in a demographic transition peak that is expected to be much lower than that of other regions (Bloom, Canning, and Sevilla, 2003). Between 1950 and 2010, the global fertility rate has almost halved and is estimated at 2.5 births per woman (Lam and Leibbrandt, 2013). However, sub-Saharan Africa’s fertility rate has declined at a much lower rate and remains relatively high at 5 births (World Bank, 2014). Data from Ethiopia and Nigeria, the continent’s most populous nations, indicate that average fertility rates have been declining over time to current rates of 4.6 and 5.7 respectively (Bhorat and Tarp, 2016). While these rates are still relatively high, the declining trend indicates that these countries are still very much in a demographic transition phase. However, different African countries are at different stages of the demographic transition: South Africa’s birth rate has already declined to 2.4 and is much further along its transition compared to Mozambique’s 5.9 births per woman, a rate that is observed to be rising with time (Bhorat and Tarp, 2016). Youth are less likely than older cohorts to find employment, and, when they do, are disproportionately more likely to be self-employed or employed in the informal sector. Subsequently, unlike other regions with aging populations, sub-Saharan Africa faces a rise in the share of its working-age population (WAP). Population data indicates that the WAP in the sub-Saharan African region will increase by 70 percent from 466 million in 2013 to 793 million in 2030 (Lam and Leibbrandt, 2013). However, high levels of youth unemployment and/or underemployment coupled with low-wage income will significantly constrain the continent’s ability to reap the benefits of the demographic dividend. 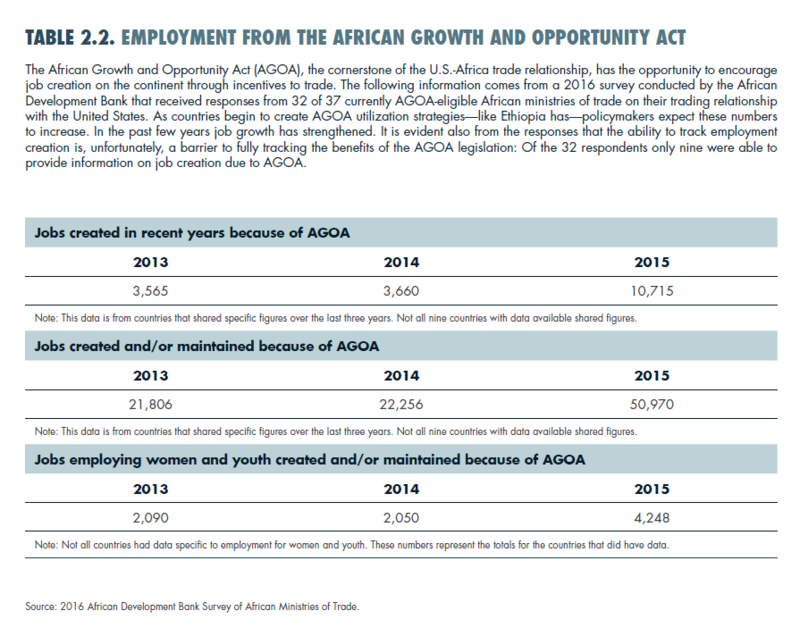 Youth unemployment across sub-Saharan Africa is four times higher than the region’s aggregate unemployment level. In Nigeria, 45 percent of the youth are unemployed and in Ghana the rate is twice as high as the national rate. Youth wages in South Africa are observed to be 40 percent less than the calculated peak labor income (Bhorat and Tarp, 2016). Research has shown that the youth are less likely than older cohorts to find employment, and, when they do, are disproportionately more likely to be self-employed or employed in the informal sector (Goldin, Hobson et al., 2015). In the sub-Saharan African region, challenges to the creation of job opportunities for the youth stem from a combination of demand- and supply-side factors. In terms of supply, there is a marked mismatch between skills demanded and those attained by job seekers. Lack of access to finance for youth and particularly female entrepreneurs further limits growth and expansion opportunities. Labor demand is constrained by insufficient private sector growth resulting in muted employment growth. Accordingly, job creation growth has severely lagged population growth resulting in historically high unemployment rates for young people. Better access to tertiary education in Ethiopia, for example, has resulted in the increased supply of skilled graduate workers relative to available vacancies for skilled workers (Bhorat and Tarp, 2016). Employers and job seekers also highlight high job search and training costs as limiting youth employment opportunities. Consequently, the average unemployment duration among potential workers is observed to be on the increase. Observing a demographic transition does not guarantee that the continent will benefit from a demographic dividend unless the shift is accompanied by nuanced policy changes that enhance the productivity of the working-age population and support the broad-based expansion of the economy and employment opportunities. Hence, we propose three main areas of focus for policymakers in 2017 and beyond. Broadening access to education will ensure a steady supply of skilled workers into the labor market to support the transition to higher value added sectors. Broadening access to education will ensure a steady supply of skilled workers into the labor market to support the transition to higher value added sectors. As fertility declines, capital deepening motivates parents to support the human capital accumulation of their children. Thus ensuring higher completion rates at the secondary school level and higher transition rates into university for male and female students alike may have a positive impact on employment and earning potential. Further recommendations revolve around re-establishing technical colleges to vary the skill sets of potential workers, reducing the cost and barriers to tertiary education, as well as transforming curriculum to provide skills that are more in line with labor demand and structural transformation objectives. Efforts must be put toward the creation of labor market information systems that can assess current skills gaps in the economy and allow for better skills planning. Any youth employment objective will necessarily fall within the broader goal of structural transformation and economic growth. This is all the more reason why it is important to diversify economic activity away from the current high concentration in traditional low-value added agriculture, as it is in many African economies, to more productive activities such as agri-processing, manufacturing, and high-value added services. For example, Kenya has a large population of educated youth employed in mobile phone-based financial services innovations that have high job creation potential (Bhorat and Tarp, 2016). 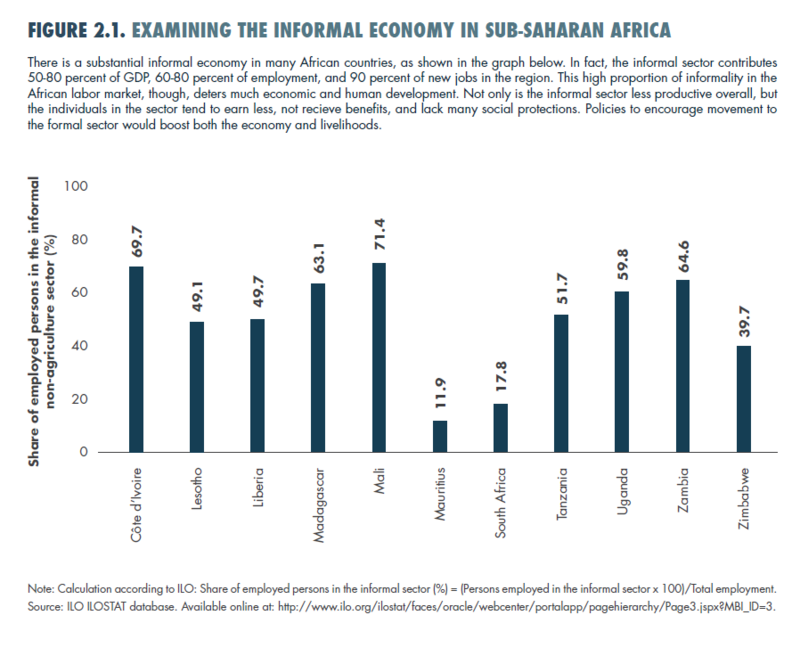 For those young self-employed workers in the informal sector, there should be institutional mechanisms that ensure adequate access to credit, in light of the fact that these individuals are likely to be wealth and asset constrained. This should be combined with strategies to improve the performance of informal businesses and create stronger linkages to the formal sector. This does not preclude larger objectives of ensuring more equitable asset and land ownership in many African countries. Improving access to formal financial services can help to more efficiently turn savings into investment and provide more opportunities for accessing credit for productive purposes. In addition, adequate taxation and fiscal policy is important for providing public goods such as schooling, infrastructure, and transportation that are crucial for any long-run growth trajectory and for improving the labor market prospects of lower-income groups and the youth. Finally, for those countries that are further along in the demographic transition, emphasis must be placed on the provision of pensions and health care for an aging population. The shift from a regime of high mortality and high fertility to one of low mortality and low fertility is known as the demographic transition (Oosthuizen, 2014). The demographic dividend is associated with the potential economic growth prospects that come with a demographic transition—reduced dependency ratios and rising standards of living as resources are freed up for savings or investments.